If you share your life with a potbellied pig, housebreaking is a necessity. Porcines aren't canines, so they won't necessarily let you know when they have to conduct their business. They like routines, so letting your pet outside at established times quickly gets them into an elimination pattern. Stick to that routine and you should be fine. Disrupt it and you could have problems. If your schedule varies too much for a routine, consider a litter box. If you have a fenced yard for your pig, you'll notice that she relieves herself in the same place, as far as possible from her favorite place to sleep or hang out. When housebreaking a pig, take her outside regularly to eliminate, praising her when she does it. Pigs won't necessarily let you know if they need to go outside of their usual schedule. While they'll hold their bowels for longer periods, that's not true for their bladders. When you start housebreaking training, keep your pig confined in a relatively small area. Pigs don't like to eliminate in their personal spaces, so they'll be eager to go outside rather than do their business near the bed and food and water bowls. Many pig owners chose to train the pets to litter boxes, much like cats. If your pig successfully uses a litter box, she won't need to indicate to you that she needs to eliminate. You'll have to clean out the litter box every day or your pig will decide to pee and poop elsewhere. They are clean animals who don't like dirty litter boxes. At maturity, your pig might weigh 150 pounds or more; that means you need a huge litter box. Plastic wading pools serve the purpose. Don't use cat litter in the box. Pine shavings, the type used for bedding horse stalls, do the trick. Place the litter box away from the pig's eating and sleeping areas. Even if your potbellied pig reliably lets you know when she must go outdoors to relieve herself, it's a good idea to have a litter box in place as a backup. 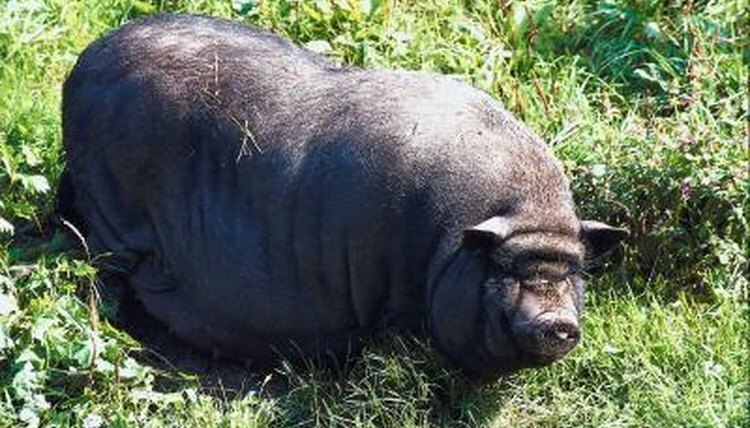 Potbellied pigs are sensitive to extreme cold and heat. In hot weather, you can let your pet outdoors briefly to do her business and return inside to your air-conditioned home, but cold and snow are a different story. She might hate going outside so much that she starts having accidents in the house. Use the litter box as a backup for your precious porcine when the temperature dips severely. If your pig begins inappropriately eliminating, there's a reason. If she's peeing all over the house, she could have a urinary tract infection. If the vet rules that out, consider any recent changes in the household. If you moved your pig's litter box or replaced it with a new one, that could be the root of the issue. If your schedule changed and you're letting your pet out at a different time, getting used to the new routine could a while.